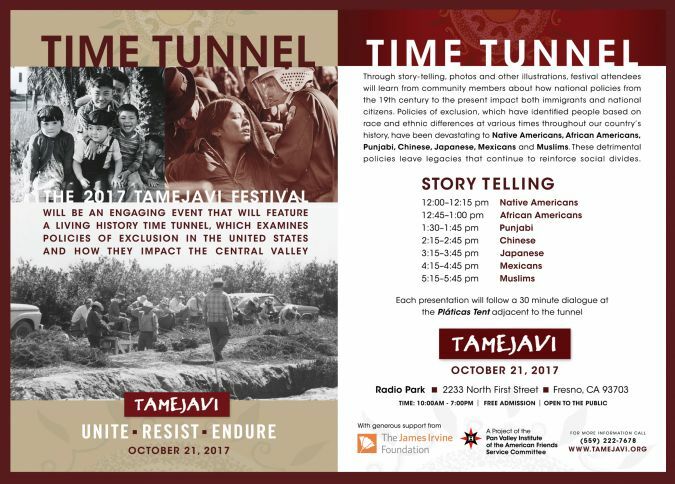 One of the components of the Tamejavi Festival is The Living History Time Tunnel examines policies of exclusion in the United States and how they impacted the Central Valley. Through story-telling, photos, and other illustrations, learn from community members about how national policies from the 19th century to the present impacted both immigrants and national citizens. Policies of exclusion identified people based on race and ethnic differences. Different polices at different times were devastating to Native Americans, African Americans, Punjabi, Chinese, Japanese, Mexicans, and Muslims. The policies leave legacies that continue to reinforce social divides. Stories of the struggles these communities have led to change these policies will also be expose.